Temporary fences provide easy barriers. Warm, sunny spring weather means that more and more people will be spending time outside, whether it’s for work or play. Construction picks up during the spring and summer, and outdoor festivals draw people outside to parks and playgrounds. In these cases, it’s important to keep crowds of people either out of construction sites or contained inside the perimeters of the festival grounds. For these purposes, it’s essential to procure temporary fences. The biggest of benefit of temporary fences is right there in the name: they’re temporary. They’re easy to setup, move, and tear down, which makes them perfect as barriers for events or projects that are temporary. You can also re-use these fences countless times, which makes them a great investment for construction companies and annual events. Large crowds are notoriously difficult to control. If there are off-limit areas, like delicate landscaping or a riverbed that could pose a danger to wandering children, then it is absolutely necessary to install fences to keep people contained. You can also set up fences to clear a route for runners or walkers who are participating in a charity event. Fences delineate the safest places to stand as well as off-limits areas. Keep property as well as individuals safe with easy temporary fences. If your construction site or event will be left unguarded at night, then having temporary fences provides an extra layer of security. Bored teenagers or wandering animals will be less likely to find their way onto a dangerous construction site. 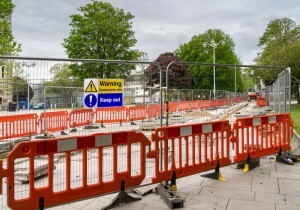 You can protect a construction site from being thieves who steal valuable copper and protect event sites from vandals who may break or steal valuable equipment. This entry was posted on Friday, May 13th, 2016 at 2:50 pm. Both comments and pings are currently closed.